Mississinawa Valley’s Alex Scholl goes in for a layup against a Randolph Southern defender in their interstate matchup on Tuesday night. The Rebels won the game, 56-43. Mississinawa Valley’s Blake Scholl lays one in against Randolph Southern in their interstate matchup on Tuesday night. The Rebels won the game, 56-43. Mississinawa Valley’s Cody Dirksen takes a shot against a Randolph Southern defender in their interstate matchup on Tuesday night. The Rebels won the game, 56-43. Mississinawa Valley’s D.J. Howell pulls up for a one-handed shot against Randolph Southern in their interstate matchup on Tuesday night. The Rebels won the game, 56-43. 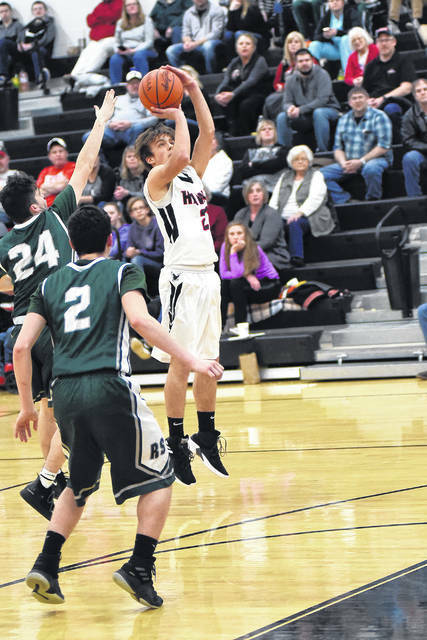 Mississinawa Valley’s Josh Fett launches a 3-pointer against Randolph Southern in their interstate matchup on Tuesday night. The Rebels won the game, 56-43. 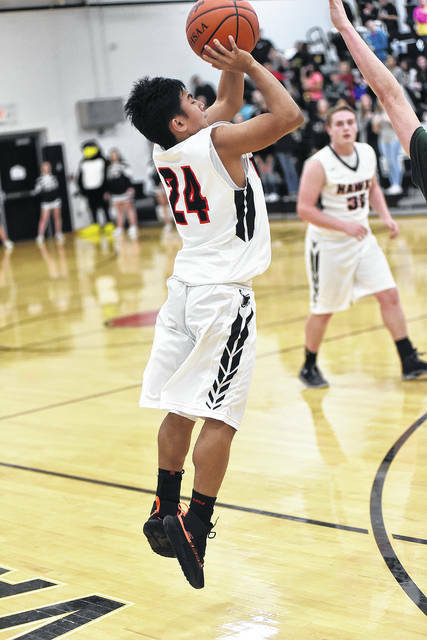 Mississinawa Valley’s Justin Miller shoots a 3-pointer against Randolph Southern in their interstate matchup on Tuesday night. The Rebels won the game, 56-43. 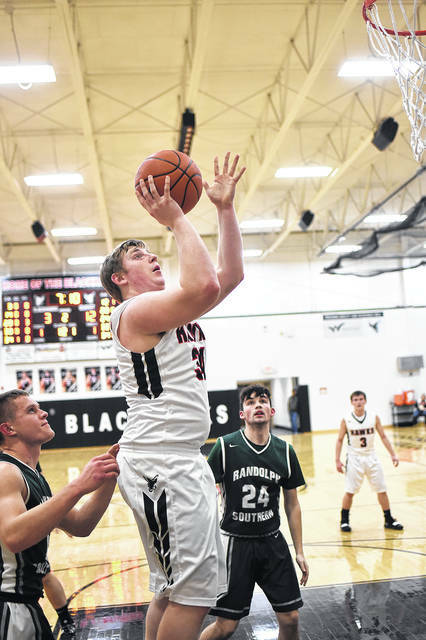 Mississinawa Valley’s Max Dirmeyer goes strong to the basket against Randolph Southern in their interstate matchup on Tuesday night. The Rebels won the game, 56-43. 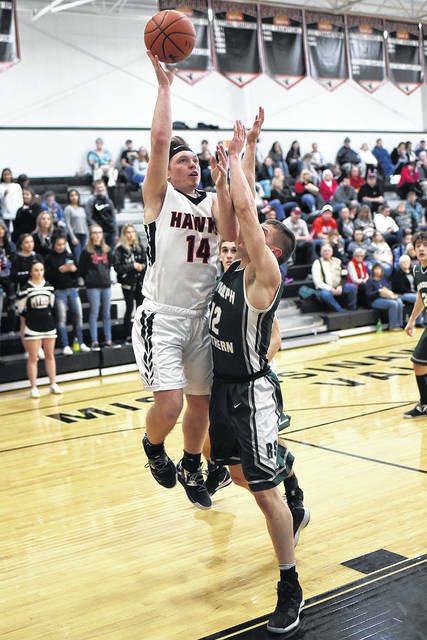 Mississinawa Valley’s Will Hall shoots a mid-range jumper against Randolph Southern in their interstate matchup on Tuesday night. The Rebels won the game, 56-43. 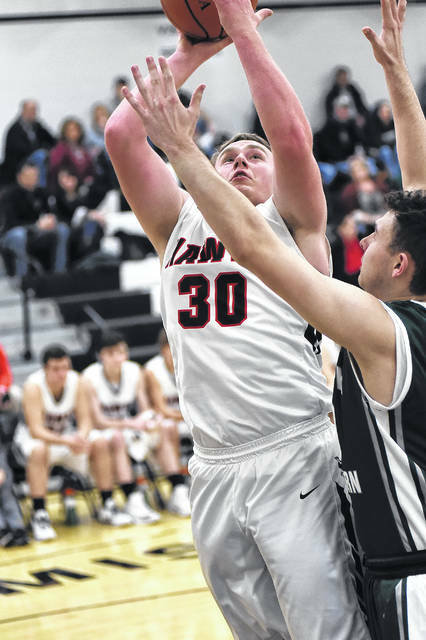 UNION CITY – The Mississinawa Valley boys basketball team never got on track with cross state Randolph Southern and dropped a 56-43 decision to the Rebels on Tuesday night. In the opening quarter it was all Randolph Southern as they jumped ahead 12-0. The ‘Hawks got on the board just before the end of the frame when Kyler Guillozet came in off the bench and nailed a trey to make it 12-3. In the second period the ‘Hawks tried to solve the zone defense with patience and moving the basketball, but just never found any rhythm or easy buckets in the process. Blake Scholl scored 5 of the ‘Hawks 8 points in the quarter, but they trailed 28-11 at the half. 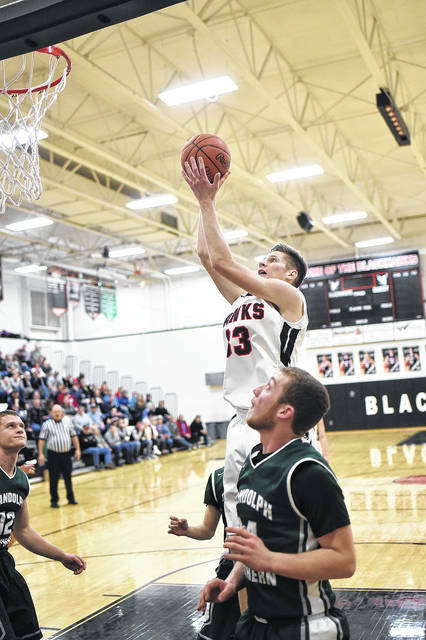 The Rebels continued to be the aggressive team going up 32-11 for a 21-point lead in the third quarter before Cody Dirksen and the Blackhawks responded. Dirksen had 6 points in the period, it would be the most competitive quarter for the ‘Hawks, but they trailed on the scoreboard 40-21. In the final stanza MV finally started to heat up from the outside with five different guys all connecting on 3-pointers as the they closed the gap down to 9 points a couple of times. “Late in the game we were playing aggressive and knocking down shots, but just couldn’t get any closer than 9. It just took us too long to respond in the game,” Mississinawa Valley coach Tim Barga said. 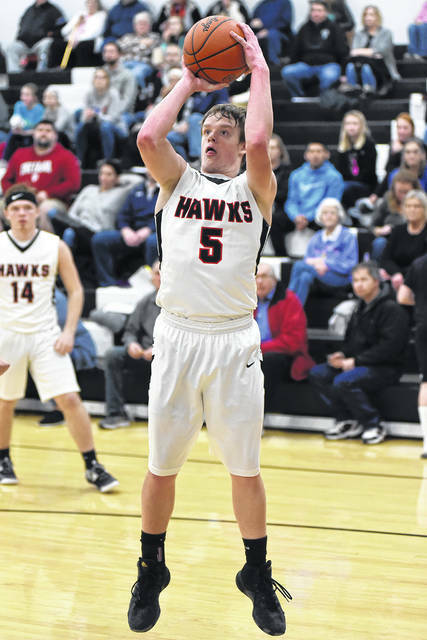 Trailing in the game the ‘Hawks would resort to fouling to catch up, but Randolph Southern was solid from the line going 13-for-17 in the period to keep Mississinawa at bay, despite the hot shooting from beyond the arch. “This game was won in the first quarter. We just never got on track. They got physical with us and we couldn’t handle it, that was a big key to it,” Barga stated. 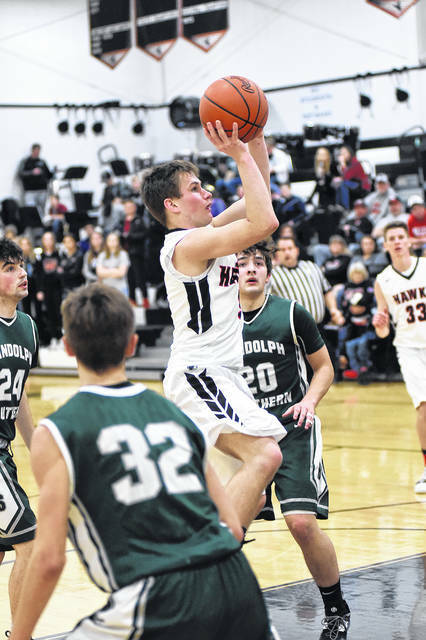 The Rebel defense was able to contain Mississinawa Valley leading scorer DJ Howell holding him to just 2 points due to their physical style of play. “We had layups we missed, we couldn’t handle the ball, it’s was just one of those games. It’s kind of been like a roller coaster we play up one game, down the next and just can’t seem to get it figured out,” Barga concluded. No one reached double figure scoring, but MV had 10 guys get in the scoring column. Mississinawa Valley falls to 9-12 overall and will be back in action Friday night when they will honor the seniors in a game against Miami East to conclude the regular season. Randolph Southern – Wissel 4, Wiggington, 13, Jessee 11, Saylor 6, Croyle 8, Spain 12, Peters 2. Totals 5-11-19/25 – 56. Mississinawa Valley – Dirmeyer 2, Collins 6, A. Scholl 3, Guillozet 3, Miller 3, Manning 3, Fett 6, Dirksen 8, B. Scholl 7, Howell 2. Totals 7-10-2/2 – 43.